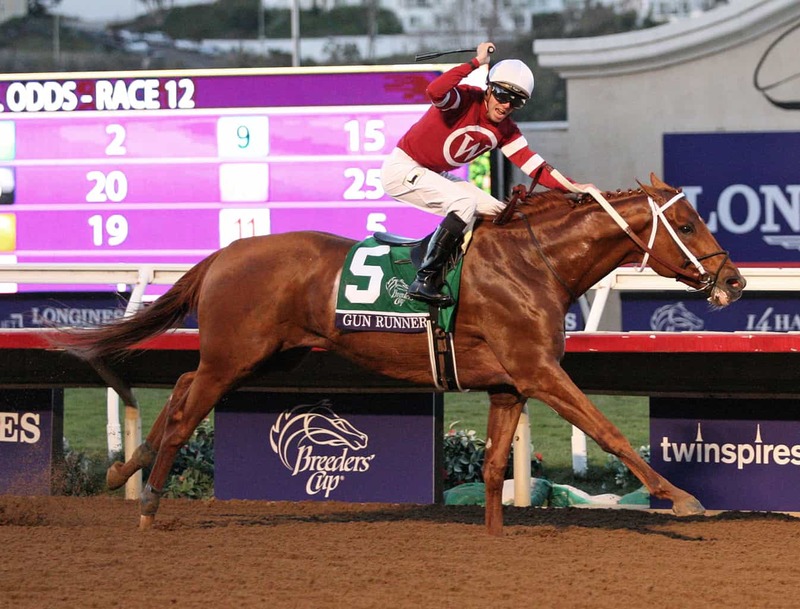 DEL MAR, CA – Winchell Thoroughbreds and Three Chimneys Farm’s Gun Runner showed the world his brilliance on Saturday, wiring the Grade 1, $6,000,000 Breeders’ Cup Classic. Off smartly from post 5 under jockey Florent Geroux, Gun Runner broke straight to the lead with Collected flanking him to his outside. The pair ran side-by-side through fast fractions of :22.50, :46.31, 1:10.50, and 1:35.03. When Collected made his bid through the far turn, Gun Runner dug in and kicked clear, edging away down the stretch until he crossed the wire clear by 2 1/4 lengths in a final time of 2:01.29. Collected’s stablemate West Coast was positioned well heading off of the far turn but couldn’t find the extra move needed to catch the winner and settled for third. Longshot War Story, defeated by Gun Runner by over 13 lengths in each of his last two starts, was able to keep closer, crossing 4 lengths back in fourth. Arrogate broke poorly from post 1, nearly hitting the rail, then spent the rest of the race attempting and failing to recover. Last year’s race champion settled for a dead-heat fifth with Gunnevera. European turf star Churchill, trying dirt for the first time, was never a factor and finished seventh. Mubtaahij never found a pace to close into and crossed in eighth. War Decree, Pavel, and Win the Space completed the order of finish. Gun Runner’s fractions were faster than the ones Sharp Azteca posted in the Las Vegas Dirt Mile the day prior, a fact that winning trainer Steve Asmussen couldn’t believe. The 4-year-old son of Candy Ride, second to Arrogate in their last meeting, improved his career record to 18-11-3-2 with earnings of $8,988,500. Geroux has been aboard since his Grade 2 Risen Star victory in February 2016. Gun Runner returned $6.80 to win, $4.40 to place, and $3.20 to show. Collected brought back $5.60 to place and $4 to show, while West Coast paid $3.60 to show.